Each year after the spring semester finishes in May and Wellesley students disperse into the world, a group of students travel with instructor Justin Armstrong to Iceland to immerse themselves in a two-week intensive summer course, studying cultural anthropology. ANTH299 takes a unique perspective in examining the field of cultural geography through the lens of anthropology. Together, students look at how the environment shapes culture and culture shapes environment. 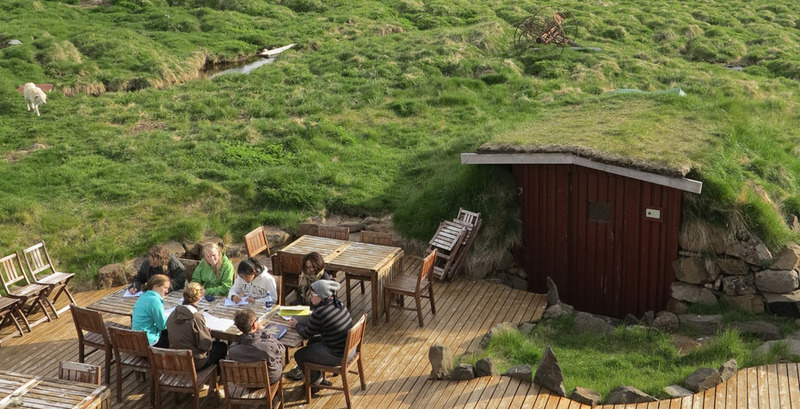 Armstrong said, "Iceland is the perfect location for this course because the setting is so striking and the connections between people and the landscape are so immediately apparent. It also serves as an introduction to ethnographic fieldwork, a practice that finds application in a number of social science disciplines." Beyond that, Iceland’s geography is also of global interest, as its glacier activity can be the harbinger of climate trends to come. In January and February NASA’s Jet Propulsion Laboratory (JPL) sent a high-precision radar instrument left to Iceland to create detailed maps of how glaciers move in the dead of winter. The maps will help scientists understand some of the basic processes involved in melting glaciers, major contributors to rising sea levels. Back on the ground... what's a typical day like in ANTH299? According to Armstrong, the learning begins around 9 a.m., when students meet for a breakfast meeting to debrief, hear a lecture, and discuss the subject of the day. After lunch, students embark on individual projects that may involve interviewing local citizens, taking photographs, making maps, shooting video, researching, or participating in a relevant cultural activity. In the evening, the whole group goes hiking or embarks on another adventure. "For me, cultural anthropology is equal parts theory and practice, and that practice comes from direct engagement with the people, places, and things that we study," said Armstrong. "For that reason I feel that it is key to a student's understanding of the discipline to have the opportunity to experience hands-on fieldwork in a new environment. Working in Iceland gives the students a chance to put the concepts they've learned in the classroom to work. In this way, I often think of our trip to Iceland as a kind of ethnographic laboratory where students can put their ideas to the test. And where else can you have a lecture in a cafe, swim in a geothermic pool, see reindeer, and explore a remote fishing village under the midnight sun all in the same day?" Interested? There's still time to register for the 2014 course. Students with financial aid may apply for loans for course expenses before the last day of spring semester classes. Home and Away is covered in Spotlight on Teaching, an ongoing web series highlighting innovative approaches, cool concepts, and exceptional teaching at Wellesley.